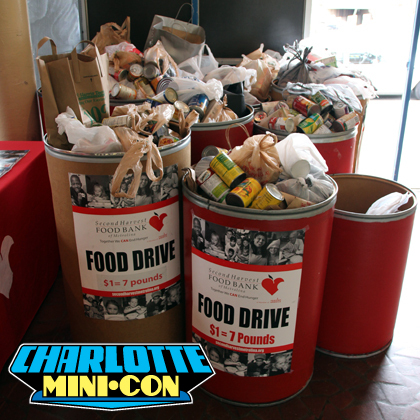 Don’t forget to get registered for #CLTMiniCon here and please bring a non-perishable food item for Second Harvest Food Bank for FREE admission. Bring a non-perishable food item and register here for FREE admission! 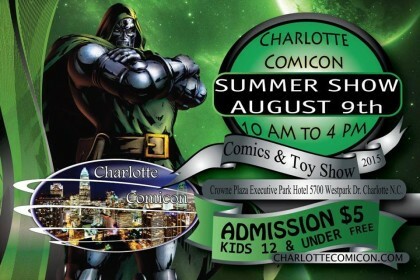 Charlotte’s longest running comic convention! Featuring great vendors and comic creators! Charlotte MiniCon is back for 2015 with another line-up of great guests and vendors. Don’t miss it! Click the button to register! CHARLOTTE MINICON :: THANK YOU!! THANK YOU! Your generosity is making a difference in the lives of people in need. You donated over 7 tons of food to the Second Harvest Food Bank! 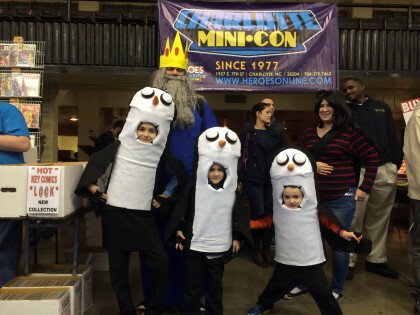 Thanks to all the fans, vendors and creators who came to MiniCon this year for making it our best yet! You guys are all awesome! Check out some photos from the show on our Facebook page, we’d love to see yours too. Please share links on Facebook and Twitter, just tag them with #CLTMiniCon. 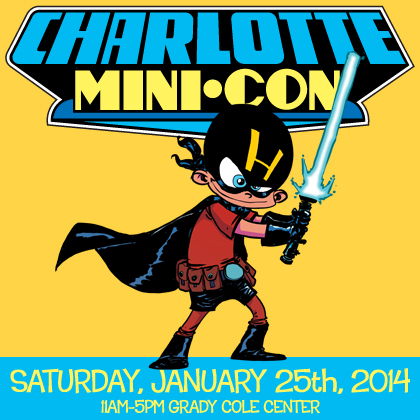 Pre-order your very own Skottie Young commemorative Charlotte MiniCon T-shirt today! Shirts will be available for pick-up at Charlotte MiniCon on Saturday, January 25, 2014 at the Fine Print Shoppe table. Any orders not picked up at the show will ship after that date. Order now to make sure you get the size, color and fit you want. Shirts are 17 plus $3 shipping in the US, no international orders please. ADD NOTE TO SELLER at checkout to SPECIFY SHIRT COLOR! Colors may vary slightly between your monitor and the actual garment. Next Level Apparel t-shirts. Sizing runs similar to American Apparel. We’re not going far but we’ll be out in force at the Charlotte Comicon this Sunday, December 15th and we’re bringing the A-Team! Shelton, Seth, Phil, Karla, Winslow and Zach will all be there to help you with all your comic book shopping. We’ll be bringing all our good stuff from the Golden Age all the way up to what’s new and hot this week! If you’re at the show, you can pick up copies of Harley Quinn #0 with a couple of weeks to create your cover masterpiece by the December 31st due date and be entered in our Art Exhibition at Charlotte MiniCon . If you’ve already completed yours, we’ll be collecting finished covers at the show too! More information HERE! Also, we’ve been putting it off because we’ve been so busy this short holiday season but our Big Holiday Sale will be next weekend, December 21-22! Look for more details soon right here on our blog. You can also follow us on Facebook and Twitter to keep up-to-date with the latest Heroes news! See you Sunday at Charlotte Comicon! 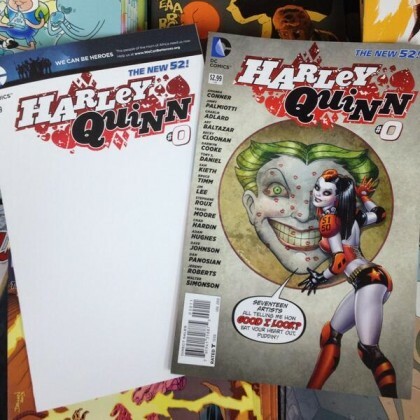 HARLEY QUINN #0 BLANK VARIANT BENEFIT EXHIBITION! Get your pencils sharpened! 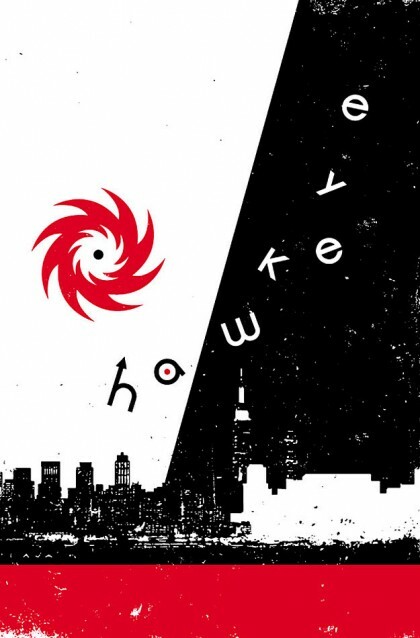 When you buy the Harley Quinn #0 sketch variant and regular edition for $10 you will be giving $5 to the Red Cross for Typhoon relief in the Philippines. Also, if you draw Harley on your cover and get it back to us by December 31st you could be awarded prizes at our Charlotte MiniCon on January 25th! Your covers will be judged by Amanda Connor and Jimmy Palmiotti! Buy yours online or in the store! More information HERE!